Home / Columnists/ Sri Lanka must get aggressive internally! 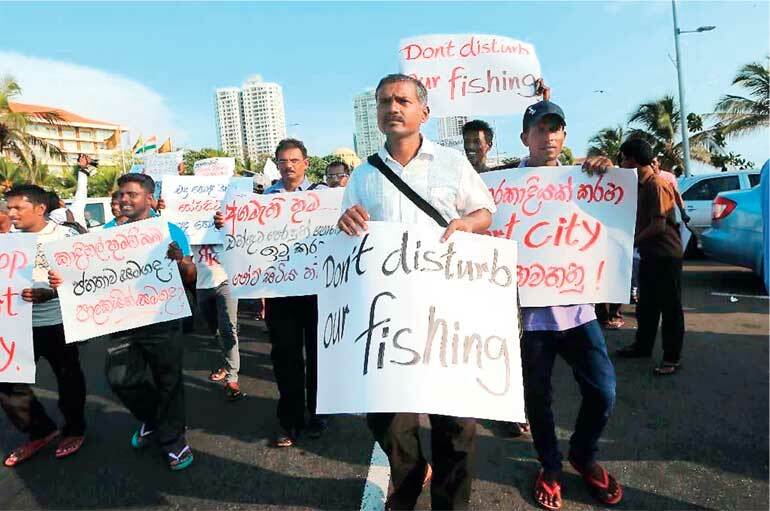 Sri Lanka must get aggressive internally! The other day when I heard that Sri Lanka will not attend the SAARC summit in Pakistan given the issues related to security, the first thought that came to my mind was that whilst we need to drive and build external relationships and partnerships, right now the issue is the raging fire at home at the consumer end. 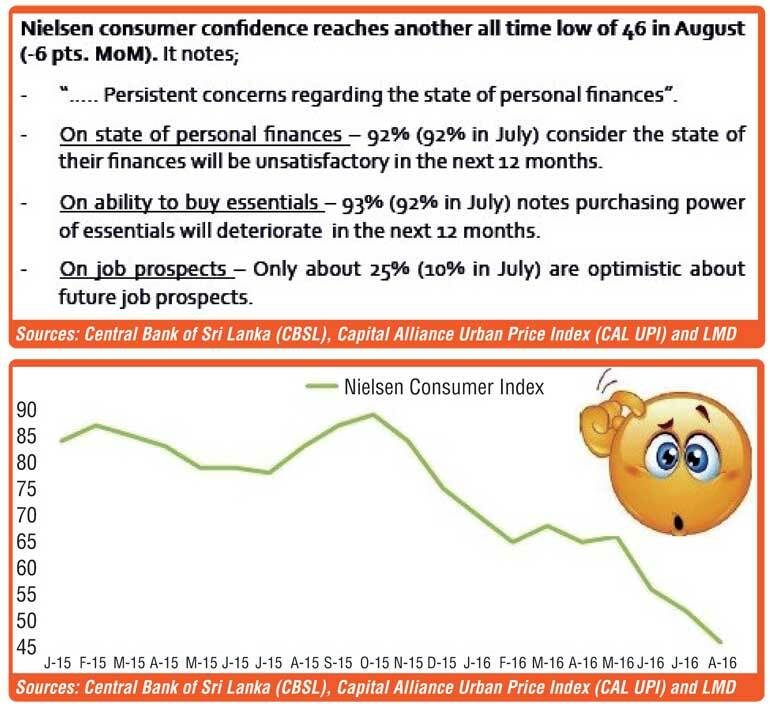 The latest data released from the Nielsen Consumer Confidence Index reveals that it is at an all-time low of 46 which is very alarming. On a qualitative front the key comments that are made include statements such as on personal finances – 93% mention that future finances will get unsatisfactory – whilst on the ability to buy essentials once again 93% state that purchasing power will deteriorate in the next 12 months which is a very worrying situation given the agitation we see daily on media. The other issues internally are the wage issue on the plantation side where the Rs. 1,000 cannot be paid by the RPCs as the NSA is challenged with COP. The overall numbers employed has come down from 7.97 million to 7.82 which adds pressure from a political front. From a reform perspective the issue at hand is that the public sector has increased from 1.17 million to 1.18 million and 1.35 million of last year which we need to think through can be an argument theoretically. But the key pick up is that there are some burning issues that need to be addressed whilst we focus on the key regional development of SAARC that happened last week. Let’s accept it; the world is looking at the South Asian region for growth in trade and the last week development on the border war sure shocked the world. The logic being on inter-regional trade, the EU is at 55% whilst NAFTA integration is stronger at 60% and ASEAN is at a low of 35%. SAARC trade as a percentage of South Asia’s world trade has steadily recorded an upward trend from 2.42% in 1990 to 14% plus today. The consensus in the region is that the reason for the poor performance on integration of trade in South Asia was attributed to the poor leadership that all South Asian countries have had over time. Things looked positive between the two Prime Ministers, but the border war that has erupted in the last two weeks will never make the above a reality in the near future. The idea of establishing a South Asian Development Fund was mooted as way back as 1991 and thereafter the SAARC Finance Ministers endorsed a roadmap for the creation of the SDF but is yet to be operationalised. One option to drive this project is to bring in a condition that a project does not have to be regional. It can be a project specific to a country based on one’s need which may be ETCA signature can also be included by December. I remember post the devastating Indian Ocean tsunami in 2004, a special session was held among SAARC Environmental Ministers in Maldives in 2005. This gave birth to the Malé Declaration, which includes areas like an early warning system and disaster management and disaster prevention systems that would come under the wing of the SAARC Disaster Management Centre – once again an area that Sri Lanka can focus on given the recent calamities in Sri Lanka on the raging fires and the severe drought experienced in the centre of Sri Lanka. Poverty eradication has been a key focus at every sarcasm conference. In fact it was on the SAARC agenda as way back as 1991. However, the only concrete step that has happened is the setting up of the Three Tier Committee that has been followed up with many recommendations that have not actually materialised on the ground. What is lacking is implementation. Maybe an Indo-Lanka partnership can give leadership to the setting up of the fund. The SAARC food security reserve was established in 1988 to meet the emergencies of member countries. However, it has taken a full 14 years to make this operational, like identifying institutions which will manage this and requirements for withdrawal but once again this will be a hold project till the war on the border stop. May be another option is the key donor partners like the World Bank and the Asian Development Bank can lead the initiative. With over 72% of the South Asian region’s people living in rural areas without adequate access to electricity, we can make South Asia develop an integrated strategy given the jagged crude prices, making diesel-powered electricity generation financially non-viable. This will call for reforms that will not only include power infrastructure, but also power grids and gas pipelines which should have been signed off during the Modi visit by Premier Wickremesinghe. The menace of drugs and narcotics, which has resulted in an abuse of public health, a convention was signed at the fifth SAARC Summit in 1991. However, this convention has met with the same fate of the Convention on Suppression of Terrorism. Whilst Sri Lanka is today free of terrorism the drug menace has achieved alarming levels. This must be stopped, putting the Pakistan-India issue on the back burner. The respected General B.P. Mallik, the former Chief of the Army, said that even with all the protocols and conventions signed by SAARC member countries, the deteriorating situation with regard to terrorism in South Asia was due to the lack of political consensus, a non-comprehensive strategy and the absence of a will to implement and provide capacity building to counter terrorism in the region. I guess the current stand-off between the major two countries is a testimony to this effect. Hence, whilst we can see the raging challenges in the region, we must first focus on the key issues related to a consumer and the decisions whilst the more macro regional issues can be concurrently looked at.